The curved displays on new smartphones coming from Korea were the target of a joke by Foxconn Technology Group's CEO, who mocked the products as phones designed to fit the rears of consumers. 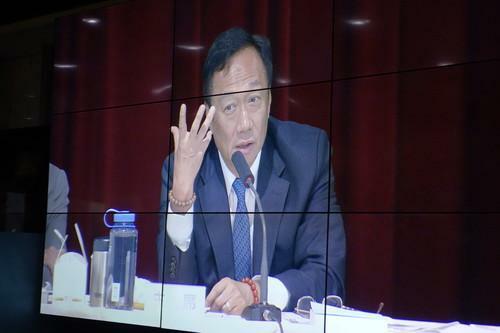 "People are talking about, wow, displays that can transform, but they forget that you have to be able to use the device," Terry Gou said at the company's shareholders' meeting on Wednesday. Both Samsung Electronics and LG have come out with smartphones built with curved screens, but Gou is less than impressed with the technology. The Taiwanese manufacturing giant assembles Apple's iPhone and also competes in building TVs. "They explained that if the men want to put a large phone into their jeans, it has to be able to fit their buttocks," he said. "This is a company ranked worldwide number 1, number 2 in displays, and their marketing is saying this." Gou also dismissed a sales point that the curved phones are easier to hold when making phone calls. "Do you listen to your phone, or do you look at your phone? You look at them. So if you look at them, why do you need a curved screen?" he recounted saying to the sales rep. "If it's a curved screen, then you won't be able to see the display clearly." It's not the first time Gou has taken a jab at his Korean competitors. He has reportedly vowed to beat Samsung in the display business. Despite Gou's complaints, some critics are liking the curved displays found on the phones. "The bend in its body actually makes it easier to hold," wrote TechHive of LG's G Flex phone, adding, "It makes the phone feel more 'premium' than it actually is." Foxconn plans to respond to its rivals with its own smartphone innovations. On Wednesday, Gou said the company was developing one such handset built with a 35-megapixel camera that sits flat on a device's surface. "If you want a 35-megapixel camera on a phone now, you need to buy it as an attachment," he said. "What we are working on will be flat."